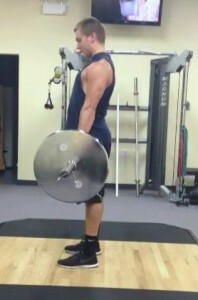 This is a brief review of a general strength training case. The trainee is an apparently healthy 20 year old male Kinesiology intern, with several years of strength-training experience. His strength has been at a plateau for at least 12 months and he would like to improve general strength and gain body weight. He mentioned an uneven barbell path during the bench press and would like to correct this. The trainee does not report any significant life stressors and does not anticipate high levels of stress or obstacles that would interfere with training over the next eight weeks. He will be able to train with a partner of somewhat comparable strength. The trainee has high motivation to train and is confident using free weights. He has had success with pre-workout supplements (caffeine) in the past and is willing to get “adequate” sleep and eat a caloric surplus. Although he participates in intra-mural basketball, he does not care much if his performance or vertical jump improves. Basketball will not begin for another five to six weeks from the start of the program. Parallel Squat – 225 lbs. for a 3 RM / Estimated 1 RM 240 lbs. 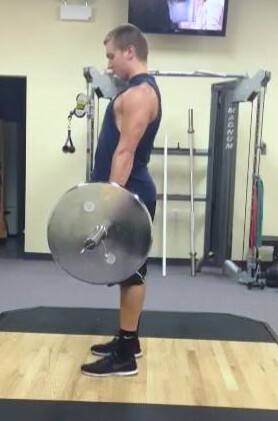 Deadlift – 275lbs. for a 3 RM / Estimated 1 RM 290 lbs. Uneven barbell path during the bench press noted. The trainee’s strength levels are intermediate, with the bench press being his most dominant lift. We reviewed his previous training program and mutually agreed that the training volume was excessive and there was too much emphasis on accessory lifts. 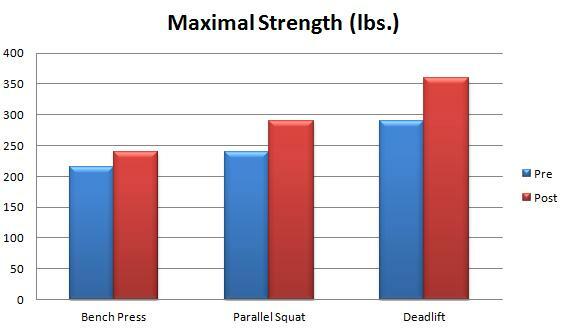 Decreasing volume and emphasizing compound lifts such as the squat and deadlift will help contribute to improved maximal strength. Taking an evidence-based approach to his strength training will help maximize his gains. An evidence-based approach considers the trainees preferences and experience, my expertise, and the best available research evidence. Prognosticating strength improvements can be challenging due to the many variables, and we agreed it was best he did not know my opinion. If I had underestimated his potential, and he knew of my expectations, it might have had a negative effect on his outcome. I was confident he would have a good overall outcome, a sentiment I expressed. The program was to last seven weeks, but was completed over eight weeks, as he needed a week off after the first two weeks due to a vacation. 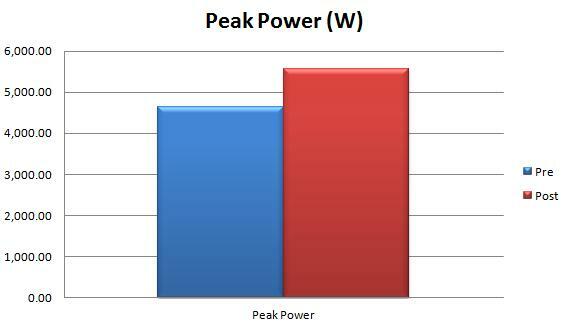 The first four weeks was focused on hypertrophy, and leaned toward strength over the last three weeks. The principles used to structure the program are described in the hypertrophy and strength-training articles on this site. Training primarily consisted of barbell and dumbbell workouts, which were performed five days a week (Monday through Friday), with weekends off. Each bodypart was trained twice a week. It was decided to include specific accessory exercises to help correct bar path deviations during the bench press. We reviewed the nutrition and supplementation guidelines for strength athletes. He decided to supplement his program with creatine and a pre-workout drink with caffeine as an active ingredient. We said caution should be exercised in taking supplements, as an amphetamine analogue had recently been identified in a popular pre-workout supplement. The trainee was pleased with the results. I was particularly impressed with the improvements in bodyweight, deadlift, vertical jump, and PP. The vertical jump was not specifically trained for, but there was a meaningful improvement, even with a significant body weight increase. I attribute much of the body weight improvement to potential water retention from the creatine supplementation and glycogen retention from surplus eating. It is reasonable to assume some increase in size was due to increased contractile tissue as well. 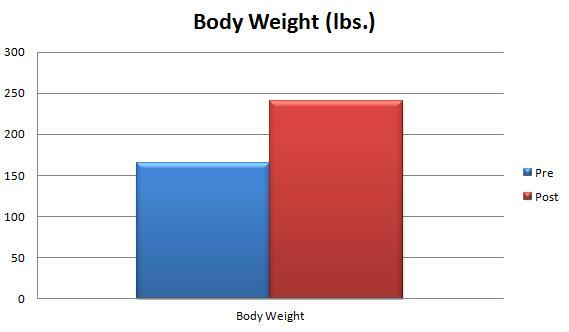 We did not assess body fat but it appeared he gained little, if any, fat mass relative to fat-free mass. I anticipate further improvement if he follows the same program or a similar one for another seven weeks after a week of recovery.